This game will decide the AVCTL Division I crown and have significant ramifications for the top seed for Class 6A West (Derby) and Class 5A West (Maize). Currently, Maize and Wichita Northwest are the only undefeated 5A West squads. All other 5A West squads have lost at least twice. Maize is plus-91, while Northwest is plus-79. On the west, Derby and Lawrence Free State are the only two unbeaten teams, though the Panthers are plus-91, and Free State is plus-84. Topeka High and Manhattan are both 6-1. Derby is 11-3 in the last 14 meetings against Maize and has captured three straight dating back to a 20-13 Eagle win in 2014. That marks the only Maize victory since ’06. Both teams have posted exceptional numbers, especially defensively. The Panthers have outscored teams, 362-39, and lead 6A in both scoring offense and defense. Maize has tallied 281 points, third-best in 5A, and has permitted just 35, also the lowest in the classification. Last week, the Eagles held Salina Central’s Taylon Peters, the state’s leading rusher entering the contest, in check. Maize defeated Salina Central, 48-26. In Week 2, Derby defeated Salina Central, 63-0. Last week, Derby defeated Campus, 48-13, for the Panthers’ 11th win in a row against the Colts. Derby led 7-0 after the first quarter and 27-7 at halftime with a late touchdown after recovering an onside kick. For the second straight year, standout Hunter Igo moved from safety to quarterback after an injury to starter Grant Adler. Derby’s backfield of Tre Washington and Kevion Edwards continued to put up big numbers. In Week 4, Derby beat Bishop Carroll, 24-6, part of a string of outstanding run defensive performances. Derby permitted just 45 total rushing yards in the first three games and then held Carroll to its lowest point total in eight years. The Panthers have captured 14 straight regular season games. Maize, known for its speed and chemistry on defense, has captured 13 straight regular season wins. Senior defensive end Noah Stanton, the defense’s most accomplished player and multi-year starter, has delivered a big individual season with 52 tackles, 12 sacks, 23 quarterback hurries, one safety, one forced fumble and a fumble recovery. Overall, Maize’s defense did permit a season-high 194 passing yards to Salina Central but limited the Mustangs to just 50 rushing yards on 29 carries. Caleb Grill, a Division I basketball commit, had another big game with five touchdown passes and averaged 42 yards per punt. Maize has now averaged at least 40 yards a punt in five of the last six games. Caden Cox had 31 carries for 147 yards and a score. Grill has thrown for 1,353 yards. For the season, Maize has allowed 73 of 147 passing for 643 yards with a 3/5 TD/INT ratio. Opponents have rushed for 99 yards a game with 2.8 yards per carry. Maize limited Salina Central to 2 of 11 on third down, and opponents are converting 23 of 102 (22 percent) on third down this year. Last fall, Derby rushed for 478 yards against Maize and converted 9 of 17 on third down in a 60-28 Panther win. Derby has won every game by at least 35 points, except for the Carroll contest. Maize will need to keep the Panthers’ high-octane offense under control and likely needs to win special teams, third downs and need another big performance from Grill and Cox. Derby’s talent across the board, especially in the running game, might be the edge. De Soto makes the trip to Hutchinson Field in Pittsburg on Friday to take on the Purple Dragons in an intriguing close to the regular season. These two schools essentially switched places in terms of classification with De Soto bumping up to 5A where Pittsburg has long been one of the smallest members. The Purple Dragons were classified in Class 4A this cycle and enter Friday’s matchup ranked No. 4 in the classification. In addition, the Wildcats and Dragons both recently departed their long-time league affiliations. De Soto is in its first year in the newly-formed United Kansas Conference after being a long-time member of the Frontier League. Pittsburg left the SEK League a few years ago to become independent in football with the objective of seeking out stronger competition in the regular-season to be better prepared for the playoffs. That freedom has allowed Pittsburg the ability to schedule games against programs like Brian King is building at De Soto. The Wildcats have improved their win-loss record in each year of King’s tenure. After a winless campaign in 2013, De Soto improved to 3-6, 6-4, and 7-3 the next three seasons. 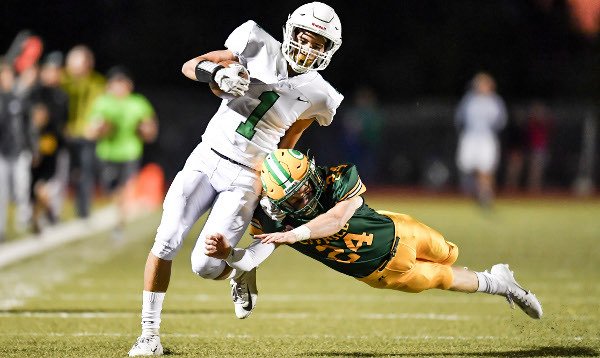 Then last season, the Wildcats finished ranked second in the final Class 4A poll after posting a 10-2 record with both losses coming to eventual champion Bishop Miege. The real challenge came in rebuilding this year’s version of the Wildcats after losing 18 starters off of that team. All the Wildcats have done to date is win six of seven games and position themselves as at least a top three seed in 5A East. Sophomore quarterback Jackson Miller has been steady in leading an offense that averages nearly 37 points per contest. In addition to passing for 750 yards and 11 touchdowns, Miller also leads the Wildcats in rushing with around 500 yards and 10 more scores. Keegan Sturdy is the Wildcats’ leading receiver with 400 yards and six touchdowns. The De Soto defense is giving up slightly less than 10 points per game and has posted two shutouts. The Wildcats gave up half of their season’s points allowance in their lone loss, 35-27, to Basehor-Linwood – the most talented opponent De Soto has faced. In that game, De Soto trailed 35-7 before a furious fourth-quarter comeback that ended with a touchdown in the final seconds to pull within eight points. Meanwhile, Pittsburg started the season with five consecutive wins before being beaten handily by Class 5A No. 5 Mill Valley. Last week, the Purple Dragons went on the road and rebounded with a 28-21 victory over Olathe East. Pittsburg’s offense is directed by quarterback Ty Roark, while Brandis Evans and Brett Freeman get the majority of the work out of the backfield. Evans is a quick but punishing runner that really had a breakout junior season in 2017. The Purple Dragons also have the ability to give the ball to Dylan Jordan – a freak athlete at 6-foot-3, 215-pounds with sprinter-speed. Jordan specializes as a next-level linebacker recruit, but also has provided plenty of excitement when he gets the ball on offense. When Roark looks to throw, Dylan White is the primary target. White has 23 catches for 481 yards and has scored nine total touchdowns. The speedy White has received interest at the FCS level and has helped his resume with a standout year as a return man and as a defensive back. Pittsburg has leaned on its defense at times, although the numbers won’t be as glowing due to a competitive schedule. Senior linebacker Jarek Butcher leads the Purple Dragon defense with 70 tackles, including seven for loss and three interceptions. This game should carry a sort of playoff atmosphere as both of these teams are playing for a high seed in the respective classifications. De Soto will likely finish as the No. 2 seed on the east side of Class 5A, while Pittsburg can guarantee itself at least a top four seed on the east side of Class 4A. Mulvane will make the short trip south to take on Wellington in a key game featuring what will be two of the top four seeds on the western half of Class 4A. Wellington enters this week alone on the No. 2 seed line on the west side of Class 4A. The Crusaders are 6-1 on the season; their most wins since 2009. Coach Zane Aguilar’s Crusaders opened the season with an impressive 32-0 shutout of Wichita Collegiate, then suffered their only defeat of the season in a 28-0 loss to Class 3A’s No. 1 Andale. Wellington has won five straight games paced by an offense that averages nearly 30 points per game. Quarterback Michael Ledbetter has played well this season, and DeAndre Washington has developed into one of the classification’s top receiving targets. Senior Grey Hatfield has been a workhorse in the backfield for the Crusaders – evidenced by his 35-carry, 160-yard performance in last week’s 22-7 win at Winfield. Like Wellington, Mulvane enters Friday’s matchup on a bit of a win streak. The Wildcats have won four straight since a loss at Wichita Collegiate. Actually, that’s all that separates Mulvane and Wellington this season in the standings. Wellington handled Collegiate, while Mulvane fell 42-22 to the Spartans in Week 3. Both teams have 28-point losses to Andale. New Wildcat coach Daniel Myears has his young offense averaging north of 33 points per game. Quarterback Tab Creekmore has had an exceptional sophomore season thus far. Creekmore has completed 54 percent of his passes for 1,220 yards and 17 touchdowns. When Creekmore looks to pass, he has experience in senior Drew Ellis. Ellis earned Kpreps all-state honors last season with 41 recpetions for 779 yards and nine scores. This season, Ellis has 27 catches for 564 yards and seven scores. Jacob Walker has added more than 350 receiving yards and four more scores. The Wildcat ground game is led by junior Cole Diffenbaugh who is just five yards short of 1,000 on the season and has scored 11 touchdowns. Diffenbaugh has also proven to be a reliable option out of the backfield with more than 300 receiving yards and five scores. In addition to this game’s importance in terms of seeding on the west side of 4A, it also will help decide the pecking order in the AVCTL-IV final standings. While Andale has already wrapped up the league title, Friday’s winner could finish second depending on Collegiate’s outcome with Clearwater this week. Expect a close game between two teams that we could see in the quarterfinals of the Class 4A playoffs in a few weeks. The Class 3A, District 1 title will be on the line in Parsons on Friday night as No. 5 ranked Galena travels to take on the host Vikings. Galena moved into the top for the first time this season after last week’s 38-0 shutout of Columbus. It was the Bulldogs’ third shutout of the season and second in as many weeks. Kooper Lawson rushed for two scores and caught a touchdown pass from JC Shelton in the first quarter. Shelton also added a touchdown pass to Blake Booth. Shelton, Galena’s senior quarterback, leads a Bulldog offense that has put up 46.5 points per game this season, including 47 per game in four district wins. Shelton, 5-foot-9 and 170-pounds, is a shifty athlete that can beat you with his legs or extend plays and hit the open receiver. Shelton is just one piece of a talented Galena backfield that includes Lawson, but lost standout fullback Joseph Helton for the rest of the season due to an injury. But the Bulldogs still have multiple options and Nick Sarwinski, coach Beau Sarwinski’s son, has filled in nicely. Galena has multiple options in the receiving game including Booth, Jacob Wheelen, MJ Jones, and Logan Henderson. The Bulldog defense has been outstanding – allowing only 6.5 points per game this season. Galena will get a challenge from perhaps the most explosive team in the classification. Parsons has already clinched its first playoff berth since 2011 when the Vikings finished 7-3 and lost in the first-round of the 4A playoffs. In fact, since that 2011 season, Parsons football has won a total of 11 games – six of which have come this season. Parsons graduate Kurt Friess has taken over the program this season and helped mold a talented roster into a team that could be dangerous in the 3A playoffs. Senior quarterback Gage Friess has led the Viking offense in passing for 1,236 yards and 19 touchdowns while throwing only two interceptions. Friess is also the Vikings’ leading rusher with 477 yards and five scores. When Friess looks to throw, he has multiple options. Five different Vikings have at least ten receptions led by Patrick Loadholtz’s 18 catches for 470 yards and seven touchdowns. Davonte Yates is second on the team with 15 receptions for 280 yards and five scores. DaQuan Johnson, Dariq Williams, Anthony Pousher, and Noah Proehl round out the receiving group. The Viking roster is littered with speed – headlined by the likes of Johnson and Williams. Johnson, who has also seen time at quarterback during his high school career, has 140 rushing yards and 116 yards passing. Both Johnson and Williams are big-time threats in the return game having combined for five kick or punt return touchdowns already this season. On defense, the Vikings surrender just under 12 points per game and are led by senior Joel Schibi’s 75 tackles, while Williams has 66 stops. Johnson is among the state leaders in interceptions with six – three of which he’s returned for touchdowns. He also has two forced fumbles, including a fumble that he returned 70 yards for a score to change the momentum in last week’s 42-22 win over Caney Valley. This shapes up to be a matchup of power versus speed. Galena wants to play ball-control and establish a strong run game. Parsons has the capability to hit on several big plays, but the Vikings will need to establish a run game in order to keep their defense off the field. Ultimately, the team that can limit mistakes will come out on top of District 1. This contest, the first between the schools in at least 14 years, will decide the second- and third-place teams from District 6. Both squads have lost only to Conway Springs, the district champion, but have found success in different ways. Chaparral is sixth in 2A scoring with 303 points (43.3 points a game). However, the Roadrunners have permitted 154 points, most in the classification among any team with two or fewer losses. Trinity has allowed just 41 points, second-best in 2A behind Humboldt’s 32 permitted, and scored 176. However, the Celtics have played the No. 17 SOS, while Humboldt has faced the third-worst SOS in the 48-team classification. Trinity went 6-4 last season and scored 22 points per game while allowing 18 per game. This fall, the Celtics have multiple outstanding wins, including 38-0 against Inman in Week 2, and 8-6 versus Ell-Saline in Week 3. Those teams are a combined 11-1 when they don’t play Trinity. Ell-Saline has scored 40.3 points per game when it doesn’t play Trinity, and Inman has averaged 37.3 points a game in all other contest. The Celtics, which captured the Heart of America crown, lost 22-8 at Conway Springs in Week 4. Senior Kaleb Hammeke has again paced the Celtics in a great all-around season. He has completed 46 of 76 passes for 424 yards with a 3/3 TD/INT ratio. Senior Aaron Guerrero has 117 carries for 686 yards and eight scores, while Hammeke has rushed 61 times for 424 yards and seven TDs. Sophomore Andrew Bergmeier has played in just three games with 201 rushing yards and 9.1 yards per carry. Last season, Bergmeier had a great freshman year with 729 rushing yards, one more than Hammeke for the team lead. Trinity has just five turnovers and is plus-12 in turnover margin. Hammeke has picked off four passes, and Zane Schroeder has a team-high 83 tackles. Hammeke has returned a kickoff for a score. Four of the top-five and 11 of the top-13 tacklers are seniors. Trinity has averaged six yards per play. Chaparral has averaged 7.1 yards per play. A big difference comes in plays per game. The Roadrunners have 53.3 plays per contest, while Trinity is at 45.4. Chaparral senior quarterback Jake Burke has completed 68 of 144 passes for 1,102 yards with an 18/6 TD/INT ratio. He leads the team with 85 carries for 585 yards and 10 scores. Senior Quinton Pfaff has 31 catches for 562 yards and seven TDs. Chaparral is plus-9 in turnover margin. Junior Iverson Bello leads with 82 tackles. Like Trinity, Chaparral is very senior-heavy, including 89 percent of its rushing yards from seniors. Last week, the Roadrunners lost to Conway Springs, 53-23. Conway Springs finished with 375 rushing yards. Often times, when teams have a polar strength, it’s the other units that decide the game. The contest could very well come down to Trinity’s less-heralded offense against Chaparral’s defense. Even though Chaparral has scored a lot more points, the yards per play difference between the squads is comparable. Trinity’s ground-oriented attack and strong special teams lead to a close win. Smith Center trailed 10-7 against Plainville in the second half in a Week 4 road contest. Then, the Redmen went on a 22-play drive and scored on a 1-yard run from Hesston Maxwell. Including that drive, Smith Center has outscored teams, 168-8, since. That includes home shutout wins versus Oakley and Sacred Heart. It marked the only time this year the Plainsmen have been shutout. Smith Center has outscored teams, 274-60, and ranks in the top-four in 1A scoring offense and defense. Ell-Salline has outscored teams, 248-77, and stands in the top-eight in scoring offense and defense. Smith Center’s only loss came in Week 3, a 42-14 defeat to Phillipsburg. The Cardinals lost 8-6 at Hutchinson Trinity in Week 3. This game will decide the champion and runner-up from District 5. Ell-Saline counters with its standout quarterback Nick Davenport and a bevy of offensive weapons like Sawyer Kramer and Treyton Peterson. The Cardinals have also shown strong defense with a 27-13 road win in Week 4 at Sedgwick, currently the No. 2 scoring offense in the classification at 310 points. Against Sedgwick, Davenport rushed for 66 yards and had 31 carries for 159 yards. Luke Parks added 16 carries for 116 yards. Last week, for the second straight season, Ell-Saline needed to come back and defeat rival Sacred Heart, a heavy underdog. The Cardinals won 14-9 as Davenport threw and rushed for a score. Smith Center has averaged 309 rushing yards a game with 20 yards a contest. The dual quarterbacks of seniors Rece Buckmaster and Trenton Colby have been efficient with 15 of 26 passing for 203 yards with a 4/0 TD/INT ratio. Senior Colby Benoit has 59 carries for 687 yards and 14 scores. Ethan Peterson has 64 carries for 601 yards and seven TDs, while Maxwell is at 59 carries for 236 yards and a TD. Senior Austin Hobelmann and junior Joel Montgomery have five pancake blocks apiece. Montgomery and senior Logan Zabel each have a team-high 66 tackles, while Montgomery is tied for the team-high with eight TFLs. Smith Center has forced 18 turnovers and is plus-4 in turnover margin. Last year, this game occurred in Week 9 between a pair of undefeated teams and Smith Center won 54-0, the third straight shutout in the series. In ’14, Ell-Saline defeated the Redmen, 14-13, the key turning point in an eventual surprise state runner-up season. Smith Center is 5-1 all-time versus Ell-Saline with all six matches coming in the last six years. The 2012 matchup was also close in a 20-18 victory. This year’s game should be much closer than last fall’s, though Smith Center is starting to find its stride. Davenport is one of the state’s best players, regardless of class, but the Redmen’s depth and talent up front leads to the victory. 8M-I No. 2 Hodgeman County (7-0) at Ness City (5-2) – Hodgeman Co.